Like yesterday's Westland Healey, this is another car that doesn't fit the mold of this blog. Like yesterday's car, this is not an inexpensive car (It will sell for a lot less the the Westland Healey's $125,000.00 asking price, though). Unlike yesterday's car, the Iso Rivolta is drop-dead gorgeous. I could stare at it all day. (Which is pretty much what I've been doing). It's been said that Iso's founder, Renzo Rivolta, built the Iso Rivolta because he desired a car as fast and comfortable as his Maseratis and Jaguars were, but one that was far more reliable than either of those. He contacted engineer Giotto Bizzarrini and designer Giorgetto Giugiaro and set out to build the Iso Rivolta IR 300. The Iso Rivolta uses a Chevrolet V8 engine and transmission. The de Dion suspension and 4 wheel disc brakes came from Jaguar. These gave the car the power and handling expected in an expensive Italian GT car. The Giugiaro designed body is a masterpiece. The car being offered on eBay appears to be in very nice condition. The silver exterior and tan interior are a nice contrast. The car has been repainted, the carpet is new and it has 5 new Boranni wire wheels. Everything else is original according to the seller. I think I'll buy a lottery ticket on my way home from work tonight. I'll have to win big, though. Not only will I need enough money to cover the price of the car, I'm going to need enough to retire... I'm just going to want to sit home and stare at the car all day. 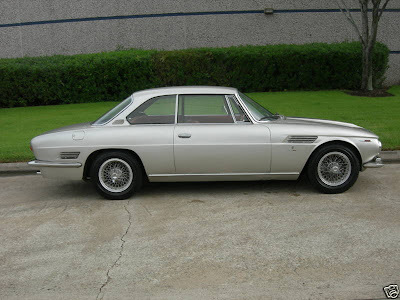 Click here to see the eBay listing for this 1965 Iso Rivolta. Click here to see a very informative Iso Rivolta enthusiast website. It looks like you scooped Bring A Trailer! It's a pretty amazing car. I'm not surprised it's getting attention. Bring a Trailer is one of my favorite sites!